This patchwork quilt is HAND quilted. The top is cotton, the backing is cotton flannelette and the batting is 100% bonded polyester. The size is approximately 40 x 50 inches. All my quilts may be washed and dried by machine. My home is pet free & smoke free. My supplies are purchased locally and I use left over pieces from other projects. You can purchase from my home or I can meet with you locally or in Calgary, or I can ship it to you. I have been making quilt for about 40 years and love it. 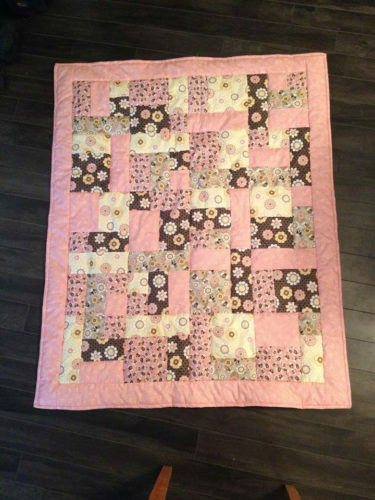 My mom got me started and I never quit quilting. Also my daughter sewed the top of this quilt and I did the hand quilting.